Signature Iron Doors are the finest in the nation. 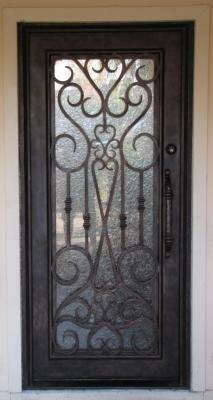 All our doors are hand forged by licensed welders. No matter your style preference, we will produce the perfect match for your home. This is a door we recently installed for a family near Chandler Arizona. Simplicity is sometimes the most pleasant appeal. Our designers create doors of all sizes and design, but here is our classic square Scottsdale style door. Call us and come visit our showroom in Phoenix Arizona to speak with a sales representative about your iron door possibilities.